CD122 signaling underlies costimulation-independent rejection. (A) Median survival time (MST) of BALB/c skin allografts on C57BL/6 recipients without treatment was 10 days (black triangles, No Rx). Anti-CD122 alone failed to improve graft survival (open circles, MST = 10 days). Mice treated with CoB (CTLA4-Ig+αCD40L) succumb to costimulation-independent rejection (black squares, MST = 21 days). Combination CoB+αCD122 prolongs survival to greater than 80 days, preventing costimulation-independent rejection in the majority of recipients (n = 6–13 per group, representative of 3 independent experiments, P < 0.0001, Mantel-Cox log-rank test). (B) Mice were sacrificed at day 10 after transplant. Representative FACS plots of splenocytes from untreated (No Rx), CoB, and CoB+αCD122-treated animals. 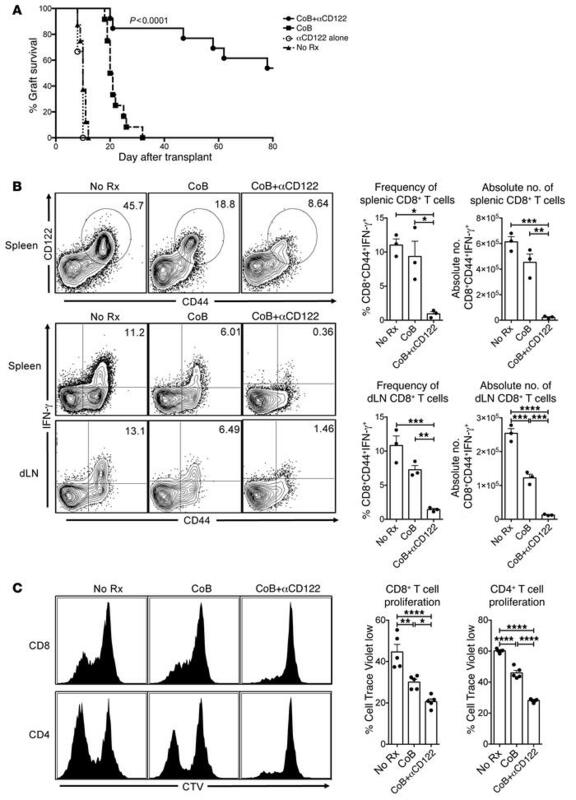 CoB+αCD122 resulted in reduced frequency of alloreactive CD44+CD122+ CD8+ T cells. Correspondingly, there is marked decrease in frequency of CD44+IFN-γ+ CD8+ T cells in both the spleen (P = 0.0048) and dLN (P = 0.0009), as well as a reduction in absolute numbers of alloreactive CD44+IFN-γ+ CD8+ T cells in the spleen (P = 0.0002) and dLN (P < 0.0001). (C) In a model of acute graft-versus-host disease, C57BL/6 splenocytes were labeled with CTV and transferred into sublethally irradiated BALB/c recipients, which were either untreated (No Rx), treated with CoB, or treated with CoB+αCD122. After 72 hours, splenocytes were harvested and assessed for CTV-labeled cell division as depicted in representative histograms. Both CD8+ (P < 0.0001) and CD4+ (P < 0.0001) alloproliferation was significantly constrained with combination CoB+αCD122 treatment. P values were generated by 1-way ANOVA followed by Tukey’s multiple comparisons test; bars represent the mean ± SEM of 3–5 mice per group (B–C). Results are representative of 3 independent experiments. *P < 0.05; **P < 0.01; ***P < 0.001; ****P < 0.0001.